In stock -This product will ship today if ordered within the next 5 hours and 4 minutes. 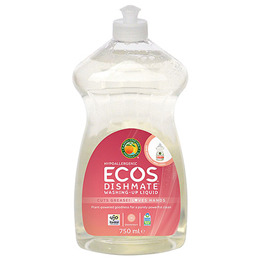 A plant-based hypoallergenic washing-up liquid with a formula that is extremely effective at cleaning dishes. Has a fresh citrus aroma of grapefruit essential oil. ECOS Washing-Up Liquid contains over 50 years of scientific passion and plant-powered goodness. Water, <5% Anionic Surfactants, <5% Non-Ionic Surfactants, Phenoxyethanol, <5% Amphoteric Surfactants, Tetrasodium Glutamate Diacetate, Perfume, Ethylhexylglycerin, Citric Acid, Limonene. Squirt on a sponge "as is" and use or dilute a teaspoon (up to 5ml) in a typical 4 litre bowl of washing-up. You may increase or decrease this amount depending on the amount of grease. Below are reviews of ECOS Grapefruit Washing-Up Liquid - 750ml by bodykind customers. If you have tried this product we'd love to hear what you think so please leave a review. Not enough suds for me so didn't feel nice to wash up with. Not sure it smelt like grapefruit but did have a nice fruity fragrance. Won't be buying this again though.